The 1998 growing season was affected by a rather hot month of August that is credited with "toughening" the skins of the grapes. September brought some rain and the vintage is regarded as more of a "Merlot" year than a "Cabernet" year. There was a two week period at the end of September/first-of-October where it rained. Merlot picked prior to that was of good quality, but Cabernets were a bit problematical. 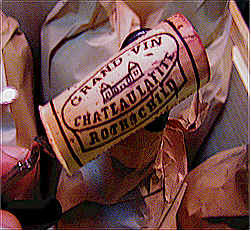 Despite the difficulties, wines such as Lafite-Rothschild were given great accolades from a number of critics. We had high hopes of tasting a stellar wine (98 points from Robert Parker would be in the 'stellar' category, no? ), but found the wines to be somewhat closely grouped in terms of quality. With Gerald adding his Two Cents' Worth. The tasters least favorite wine had a green, stemmy, unripe, barnyardy nose with sour acid and lack of fruit. A kinder soul defended its varietal (Cabernet) character, having the least oak of the set. Another liked its notes of tobacco, menthol, and sweet spice. Silage came across on another palate. Bob noted a peculiar kim-chee note which never quite dissipated but there are Cassis and cedar notes. The wine is dry, medium body, easy tannins, fair depth, length but a bit shallow. Gerald found a touch of Cassis, with some berries and a light bit of oak. It's assertive and tannic on the palate, needing time. One star (three star scale, 0 being 'standard' quality). Tannin seemed to be the issue here. One taster complained about the extremely gritty, bitter tannins and another said, the simple fruit cant carry the tannins. A defender countered the fruit does carry the tannin. Others liked the cigar box tone and the fruit and tobacco notes and its excellent aging potential. Someone described the tannins as "metallic." Bob found mineral (iron especially) notes leading off and persisting through the sweet currant-like Cabernet fruit with cherry-like Merlot gaining as it opens up. The wine seems very Graves-like. There are lots of minerals on the palate too with an abundance of unresolved tannins but a nice concentration of fruit. This will develop nicely! Gerald described the fragrance as somewhat "dusty and root-like" at first, being very "quiet." It seemed to blossom a bit with time, but was slow to do so...it's a hard-edged wine at this point and, most likely will take years to blossom. This is the sort of wine that requires an "expert who's looking at the label to give this a high ranking. Mere mortals such as ourselves, quite obviously, missed this one." One taster couldnt cope with an aroma of cleaning fluid! Others found it fruity and soft, California Cabernet-like with jammy, overripe fruit, earthy (garden dirt), green peppers, and flat. Another found apples in the nose and vague on the palate and still another found it low in acid and pedestrian. 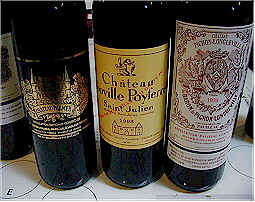 Bob tasted it the previous week in the context of lesser Chateaux and found sweet oak, sweet currant, right on for Beychevelle In the present context it showed more Pauillac character than St. Julien (reminiscent of Lynch-Bages), a nice cherry/berry/black currant thing with a trace of leather (Brett). The wine is more facile than deep. On the palate it is (again) facile with 5th growth fruit, concentration (Beychevelle is actually 4th growth). Its not a winner but its dang nice! Theres a curious off cellar note that marks it down. Gerald was quite enthusiastic about the fragrance of this wine at the start..."Lovely cedary, woodsy fragrances with sweet spices...as it airs the wine shows a touch of an herbal note...nice texture on the palate, with good fruit and fairly substantial structure for cellaring." One-and-a-half stars. Needs 8-12 years. 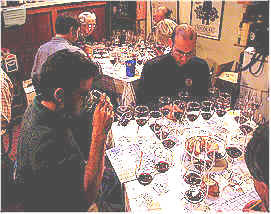 Tasters were struck by its similarity to California Cabernet. This is an example of the new international style. Others chimed in with a nice Napa Cabernet! and easily the most California-like. Others found sweet red fruits, and full body but not so full on the flavor end. Another found ripe raspberries but a very short finish. Bob missed the California connection finding the nose shrill at first and opening to show sweet oak (including coconut), minerally/terroir notes, and then the black currant pops out of the glass followed by spice; splendid! And what a lovely mouthful! Lots of spice and generous fruit and length; give it 5-10 years. Gerald found "lots of red fruits, plummy aromas and some sweet oak to the nose...the same elements are present on the palate with fairly firm tannins." One-and-a-half stars. 8-15 years of cellaring potential. Several tasters found green pepper here. Another compared the herbal note to epazote. But the herbaceous character was backed up with ripe, sweet fruit and rich, red fruit. Various tasters found charred oak, minerals and caramel and dried orange peel. A detractor found it insubstantial and quite warm. Bob waxed poetic: dust and herbs play a duet with the oak entering with its bass notes. The main theme of black currant enters finally and the several components darken, intensify, develop and integrate. The wine is closed in but showing excellent potential. This is one splendid mouthful of wine and destined for several years of development. Gerald found this attractive, at first. "Lots of violets and cedary oak. As it opened up, the vegetal, bell-peppery notes became more pronounced, suggesting some un-ripe fruit. On the palate, it was a rather ordinary wine, lacking depth and having the bell-pepper, un-ripe fruit notes predominating." One taster was particularly enthusiastic. The wine has a tremendous core of fruit, a complete wine. Another added the fruit jumps out of the glass. Another found toasty oak, herbal fruit and the longest finish of the set. Hints of coffee, mushrooms, and vanilla, from the oak were also found. These sentiments were not unanimous as some found it low in acid, high in body and sour and bitter. Bob found a curious note of pickled vegetables and pat spice but the currant-like Cabernet fruit came up along with minerals and finally Cassis. The wine is tight with abundant tannin and closed, undeveloped fruit. This should be a major achiever over the years! Gerald was not enthusiastic at the outset, finding the "fragrance slightly meaty and reminiscent of Italian salami. The wine blossomed nicely in the glass, showing cocoa, sweet oak and some red fruit. On the palate, the wine was even more impressive! Quite a mouth-full, with lots of stuffing and structure." Two stars+. 8-15 years of cellaring potential. Like a chocolate bar! said one taster and another found chocolate along with tobacco, cedar, and a nice balance. One taster found a high percentage of Cabernet Franc with its characteristic metallic finish. Another found black fruits, cedar and coffee but it has a short finish. Bob found candy-like (tutti-frutti) and cardboard notes and then remarkably deep Cassis and cola nut. It has a lovely generosity. The wine is moderately fruited with reasonable tannins and a nice length. Theres a considerable future here (5-8yrs) but its not a top entry. Gerald described this as having a "light note of cocoa and some woodsy, cedary fragrances. It's a bit wild & wooly on the palate, with good structure and a nice 'center' of fruit." One-and-a-half stars. 5-15 years of aging potential. This top wine was liked for its hints of loganberry and dried thyme with notes of dusty mulberry on the palate, a classic Bordeaux. Other descriptors voiced were lively, herbal fruit, long finish, and finally a wine of depth and concentration. One taster felt it was "riper than the others and the all-around, best balanced wine of the tasting." Another person found a hint of the leathery Brettanomyces fragrance. Bob liked its gorgeous oak component contrasting with the deep Cassis fruit and some cherries from Merlot and creamy notes from the malolactic. The oak will integrate nicely to create a deep, cedary tone as it ages. The oak and oak tannins are easily manageable which, with its excellent structure, will carry it for at least 10 years to full development. Gerald found a slight "floral and violet or rose perfume with some cedary notes. It's moderately tannic and has light fruit on the palate." One star. 5-10 years aging potential.